Ever dreamed of watching falling stars from your western NC mountain cabin deck? If so, you’re going to want to check out Heaven’s Point in Old Fort. Located within Gateway Mountain, a gated community, this two-bedroom, two-bath rental home provides breathtaking views that are unobstructed by city lights. 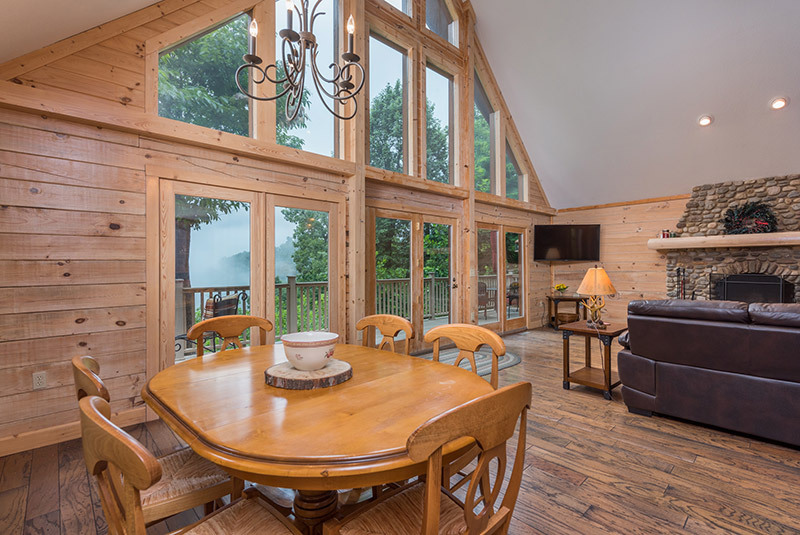 And while the views are remarkable, so is the layout of this lovely log home. The two bedrooms have king-sized beds with an additional pullout twin trundle in the main floor bedroom. The main floor living room features a stone constructed, wood-burning fireplace. From in front of the fire, you can enjoy the expansive view outside as well. The large great room has vaulted ceilings and large, floor-to ceiling windows that allows for primarily unobstructed views outside. And you’re going to want to spend some time outside as well. The gated residential nature preserve has hikes and trails, in addition to a nearby waterfall. As an added bonus, this meticulously-maintained home is one of Greybeard Rentals’ pet-friendly listings so you can bring the family dog along for a small additional fee. If you’re bringing along your dog, please be sure to see some of the top ideas of places to take your dog in the Asheville area. If you’re trying to decide when to come, there’s a Greybeard webpage for that! And while you’re about and about, you’ll want to take in Old Fort in addition to nearby Black Mountain and Asheville. To plan your trip, take a glance at Greybeard’s Asheville Events page to see what’s happening up this way prior to your visit. For more information about this home or any of our western NC listings, please contact Greybeard Rentals. There isn’t a bad time to come check out the area and take advantage of the clean, crisp mountain air.